It’s gameday — Game 7 day. The Oklahoma City Thunder and Golden State Warriors have captivated us for two whole weeks. The journey ends where it began, on a Monday inside Oracle Arena. 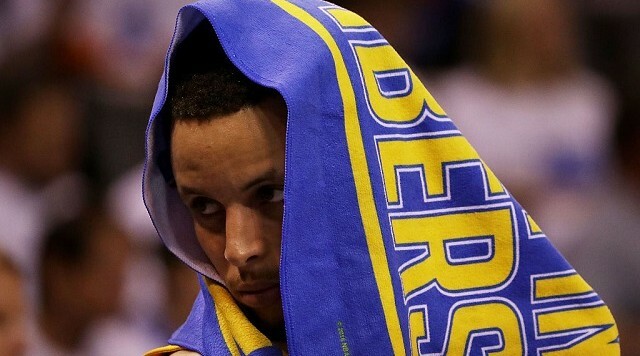 Either way, the resolution of the Western Conference Finals will reverberate through the NBA. Either the Thunder arrest their slide and win a second game in Oracle this series — enabling them to claim two wins in both Oakland and San Antonio during their playoff run — or the Warriors become the tenth team in NBA history to pull off a 3-1 series comeback. So much NBA history is on the line in this game, but we’ll save that for a separate piece. How many minutes will Billy Donovan need to rest Kevin Durant? No. 35 has played 45 minutes in each of the last two games. It is hard to think he can play 45 minutes in Game 7 and be as effective as he needs to be. When the Warriors go deep into their bench in the first half, especially Anderson Varejao or Mo Speights, Donovan might need to steal a few extra minutes with Durant so that he’ll have an extra measure of freshness at the end. If the Thunder can preserve Durant and (to a slightly lesser extent) Russell Westbrook for six to eight bench minutes and not surrender more than a net loss of two or three points, they should welcome that prospect. How many bench plays — not just points, but plays — will Oklahoma City need? It’s true that Dion Waiters has scored a grand total of three points in the last two games combined. It’s also true that Waiters or someone on the Thunder’s bench needs to put the ball in the basket a little more than in Games 5 or 6. However, Waiters swung the San Antonio series with his defense and effort plays. He could swing Game 7 with the same contributions. Let’s put out the more specific question, then: How many bench plays — the combination of points, boards, assists, steals, and blocked shots — will Waiters and the OKC bench deliver? Waiters totaled nine plays in Game 6, eight in Game 5. In Game 4, his “bench plays” total was 16, and in Game 3, it was 19. Waiters’s “bench play” number in Game 2: 13. Game 1? 15. How many effort plays will Draymond Green make… and how many OKC offensive rebounds will he prevent? Draymond Green has produced his only two double-doubles of the series (points and rebounds) in Games 5 and 6, a more-than-coincidental reason the Warriors have tied the series. However, Draymond has always been the kind of player who can dramatically influence a game without scoring. 8, 11, 5, 15, 18, 16. Given that Klay Thompson can’t be expected to uncork another thermonuclear shooting display, the Warriors might need at least 20 effort plays from Draymond in Game 7. Unless this game is a blowout entering the fourth — which is extremely unlikely — consider how the Thunder’s San Antonio series and this one have both taken violent turns based on fourth quarters in Oklahoma City. In Game 4 against the Spurs — a contest San Antonio largely controlled for most of the first three quarters — the Thunder abruptly turned things around with a 34-16 fourth quarter. OKC won the San Antonio series based on an ability to win three relatively contentious games thanks to fourth quarters with 21 or fewer points allowed. In Game 6 of these West Finals, the Thunder were on the other side of a turnaround. They were the team which controlled the action for most of three quarters, only to lose the fourth quarter, 33-18. The Thunder saved their season against the Spurs with a spectacular defensive fourth quarter, and they blew their best chance (though not their last) to win this series with a terrible offensive fourth quarter on Saturday. Pay attention to a shutdown fourth quarter for one of these defenses. Holding the opposition under 20 points in the final stanza has been an important and enduring theme in the West playoffs.